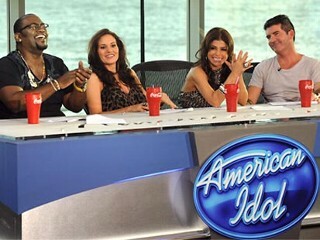 NEW YORK – An estimated 30.1 million people watched the season debut of "American Idol" on Tuesday night, making it the most-watched prime-time show of the TV season so far. ya i saw that but i dont think ryan had any bad intentions..thay guy is not completely blind..he has "tunnel vision", thaz the reason why ryan put up his palm right in front of his eyes so that he could see..but i guess that didnt happen..awkward i guess..
reminds me of a similar predicament i was in when i tried to shake hands with a guy who did not have his right hand (it was severed upto his elbow) man, i didnt know what to do so i cusped his elbow with mah right palm and shook it as if i were shaking hands..
Last edited by DesiBaba; January 15th, 2009 at 11:09 AM. now after seeing such stuff more people will hook onto it. maybe it was a stunt for increasing the popularity of the show as in past it was on downhill. I think that girl in a bikini was scripted by American Idol just to add some 'masala' to the show. The girl must be a okay singer and they cooked up this stunt with her. Anyway, Idol ratings slipped by 10% last night. office me yeh thread scroll kiya to bandi ki pics thi... abhi gayab... was it really here or just me working too hard and fantasizing? i can see the pics bro..
simon was like have you just came from a meeting with Bill Gates?